Episode 8: "Asuka Strikes!" Episode 8: "Asuka Strikes!" Ryoji arrives from Germany some time after the story begins, bringing with him Eva Unit 02 (the first production-model Eva), its pilot Asuka, and a strange "being" code-named ADAM. 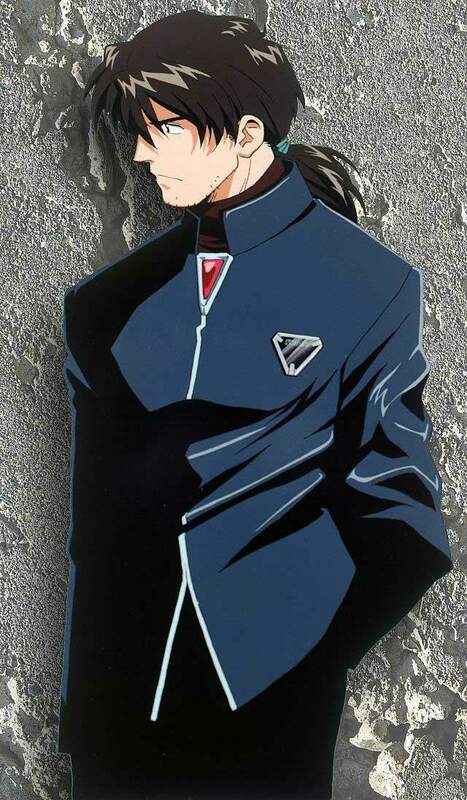 Something about ADAM bears some great importance for Gendo Ikari and NERV's ulterior motives. Ryoji is actually a double agent, working with the Japan Department of the Interior in an attempt to uncover NERV's true motives (which have recently become suspect). However, Gendo is himself using Ryoji for his own ends, and Ryoji knows it. He uses what he knows to make some startling revelations. Kaji, Misato, and Ritsuko all had attended the same college, and the three know each other. When he arrives in Japan, Kaji starts out really getting on Misato's nerves with his very casual demeanor and openness when it came to topics for conversation. The two had had a relationship while in college, and Misato doesn't (at first) want to rekindle it, wanting to move on to a more-serious relationship (besides, she said, he reminded her of her father), but he knows that Misato isn't telling the whole story. Shinji trusts Kaji and talks with him on very interesting topics, ranging from Kaji's garden to questions on human existence. And Asuka has had a huge infatuation on him since before the two of them arrived in Japan. Ultimately, Ryoji proves himself to be prepared for his own fate. Even as he knows what will happen when he rescues Kohzoh Fuyutsuki from SEELE, when he sees that his fate is upon him, he simply smiles and says, "Oh, hi. You're a little late, aren't you?"